According to multiple sources close to ESPN’s Chris Mortenson, former Oregon quarterback Marcus Mariota will throw for prospective teams at 2015 NFL Combine to be held February 17-23 in Indianapolis. 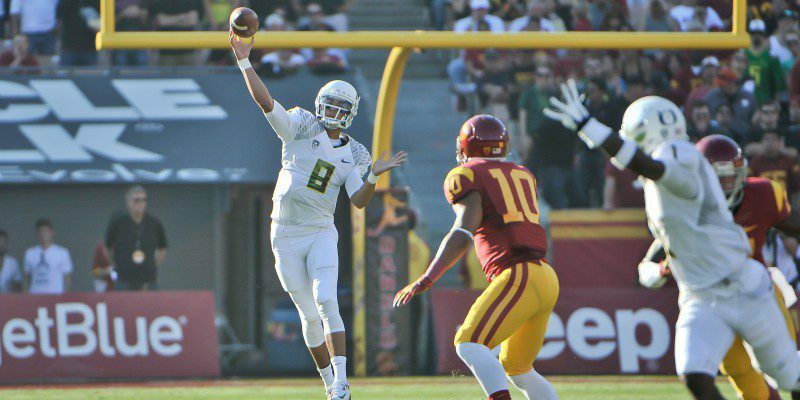 Mariota, along with Florida State’s Jameis Winston, are considered to be the top collegiate quarterbacks available in the 2015 NFL Draft. To what extent to participate in the NFL Combine is a major decision for elite prospects to make, and it often primarily involves the player’s agents. Some agents prefer to hold a private workout for teams so they can control the environment — usually held at the prospect’s home university. The decision whether to throw for teams is especially significant for Mariota after he suffered a sprained shoulder in the 4th quarter of the Ducks’ January 12th loss to Ohio State in the National Championship Game. Normally, players looking to move up in the draft like to demonstrate their skills. However, players who are confident they will be selected high normally prefer to limit their exposure to injury and other factors that could cause their draft status to slip. Prior to the 2014 Draft, UCF’s Blake Bortles did throw at the combine and ended up being selected No. 3 overall by the Jacksonville Jaguars. However, Texas A&M quarterback and former Oregon Duck commit Johnny Manziel decided not to throw at the combine and was selected 22nd overall by the Cleveland Browns. 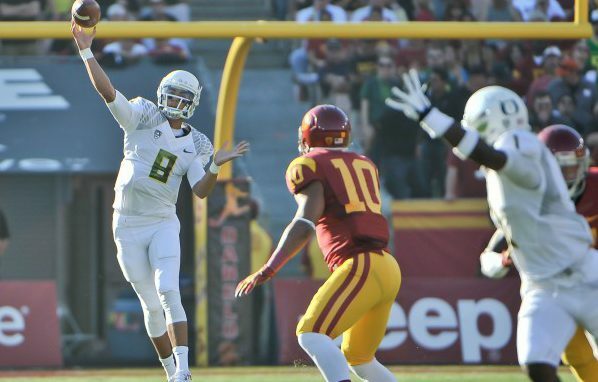 In his Heisman-winning junior season at Oregon, Mariota accounted for 5,224 total yards and 58 touchdowns. This included 42 touchdowns through the air, while he rushed for 15 other scores and caught one pass.